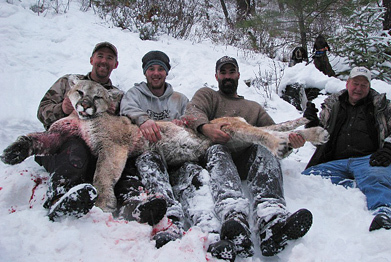 In the winter of 2007-2008 we took the #2 lion in Idaho all-time and #10 all-time in the world, it was the largest cat taken in Idaho in 19 years. Idaho and Nevada have very high populations of this extremely elusive animal. Mountain lions are one of most sought after predators in the nation, and there is no wonder why after seeing one up close and personal. 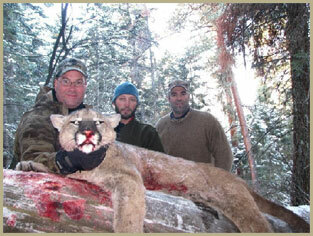 They are very powerful and majestic animals, able to take down a young elk or deer with little effort. 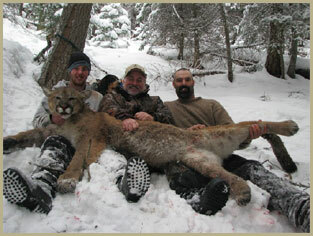 This hunt takes place either in northern Nevada or along the Lochsa River in Idaho. We do these hunts starting in mid November and running through February. In Nevada we stay in hotels and in Idaho we stay at the beautiful Lochsa Lodge (see it at www.lochsalodge.com). We go out early in the morning and cover as much country as possible by 4-wheeler, snowmobile, truck, or our guides may even snowshoe to cut a mature lion track. Once this happens we let the dogs go and watch and listen to them work, it's really amazing to see hounds in action. We've had about 90% successon these hunts over the years, and if you do not have an opportunity at a lion we'll bring you back the following year at a discounted price. We take many cats in the 8 foot range each year. 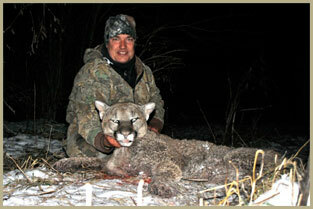 All lodging and meals included with this hunt.